Drøbak is the only all-year christmas town in Norway, and every year they recive about 20 000 letters to the Norwegian "Julenisse" from all around the world. Drøbak is a town and the centre of the municipality of Frogn, in Akershus county, Norway. The city is located along the Oslofjord, and has 13,409 inhabitants. Drøbak and Frogn was established as a parish on its own through a royal decree Sept. 8, 1823. It had been a part of Ås parish. Drøbak was established as a municipality January 1, 1838 (see formannskapsdistrikt). It was merged with Frogn January 1, 1962. Traditionally, Drøbak was the winter harbour of Norway's capital, Oslo, since in severe winters the fjord will freeze from outside Drøbak all the way up to Oslo. It had a city status between 1842 and 1962, upon which point the municipality was merged into the rural municipality Frogn and lost its city status. The city status was regained by the municipality council on 13 February 2006. It was also decided that adjacent villages such as Heer would be included within the city. Early Drøbak had ferries that crossed the fjord, in modern times they have largely been replaced by an underwater tunnel. However, some of the old ferries are still used as "floating restaurants" during the summer. In summertime, cruise ships visit Oslo almost every day. Often, as many as four or five cruise ships visit each day, in addition to all the regular traffic, it has made Drøbak a popular sea-side tourist spot. However, the numerous restaurants, art galleries and mild summers are probably more important factors for visiting tourists. Drøbak is also known for its many art galleries. The town has a Christmas shop called Julehuset (the Christmas house), and letters often end up in Drøbak from Europe similarly to how they end up in Santa Claus, Indiana in the United States. During the summer months, there are tourist buses going from Oslo to Drøbak on day trips for tourists. Visitors can experience a traditional Norwegian fjord town. It is also a popular Oslo suburb for citizens to live as public transportation is well connected between Drøbak and Oslo, both by bus and boat. At the marina at the approach to Drøbak is a sculpture, made by Reidar Finsrud, cast in bronze of three mermaids sitting on a rock. The sculpture was unveiled in 1999.
lfish is open to the public and shows live video footage of the sea life in the fjord where fish, lobster and crab are often visible for the aquarium visitors. Norsk Luftambulanse is headquartered in Drøbak. The Norse form of the name was Drjúgbakki. The first element is drjúgr 'hard; long', the last element is bakki m '(up)hill'. This is related to the very steep roads winding down into the city center of Drøbak. Gyltåsen, which mainly consists of cabins and "season-housing". Husvik, where most of the year-around boats are being kept. This area was also significant in the sinking of the German cruiser Blücher in 1940, as the location of the Husvik Battery of Oscarsborg Fortress. The guns of the battery are still in place in these hills as tourist attractions. Sentrum (city centre), here lies "Julehuset" and most of the local stores. Most of the City Centre is being protected by local laws as "Verneverdig" which in short terms means that it has a significant cultural value and cannot be changed or rebuilt. Therefore, much of the city centre looks like it did 100 years ago. Skiphelle and Elleflaten, an area consisting of suburban housing and a tiny hotel called "Drøbak Fjordhotel". Sogsti, consisting of much of Drøbak's suburban housing. Odalen and Haveråsen is the "outer banks" of Drøbak, where the housing and population consists more of agricultural purpose. Belsjø and Heer, the suburban housing around the large golf course surrounding most of northern Drøbak. Ullerud and Dyrløkke, a large hill of suburban housing. Here are also the local mall and a large school up to high school level. "Drøbak kirke og kirkegård". lokalhistoriewiki.no. Retrieved September 1, 2018. Sigrid Marie Christie, Håkon Christie. "Drøbak kirke". Norges Kirker. Retrieved September 1, 2018. Bernhard Magnussen. "Niels Carlsen". Norsk biografisk leksikon. Retrieved September 1, 2018. Dag Myklebust. "Domenico Erdmann". Norsk kunstnerleksikon. Retrieved September 1, 2018. Wikivoyage has a travel guide for Drøbak. Wikimedia Commons has media related to Drøbak. Drøbak is a town of historical interest; this is where the German ship Blücher was sunk during the German attack on Norway on the morning of April 9, 1940. The ship transported German soldiers passing Oscarsborg Fortress, and the sinking of the ship delayed the German invasion and allowed the government, parliament, and royal family to evacuate to England. The fortress is located five minutes by ferry from Santa’s post office, with hotels, spas, and even an opera each year. Oslo Airport Gardermoen, Norway’s Main Airport. Travelling time by car to Drøbak is approximately 1 hour (50% more during busy day hours through Oslo Ring Road). For more information on facilities at and around Oslo Airport, Gardermoen, see the Oslo Airport, Gardermoen article. Good moorings if you have your own boat. In the period April 15 to September 30 you may travel to Drøbak by ferry. The ferryboat leaves every day from Aker Brygge in Oslo, landing at Sjøtorget in Drøbak. This ferry stops at Oscarsborg Fortress and Håøya. Bus routes 541 and 542 from Oslo, about 40 minutes away. The fare is 74kr. The mentioned routes for bicycles are tempting drives for MC-enthusiasts who want to avoid the motorway and enjoy curvy country roads. A taxi from Oslo will cost you about 500-600kr in the daytime, and about 1000kr in the evening or at night. On longer taxi rides, it's OK to bargain with the driver for a fair price. The town of Drøbak is small, and most can be reached on foot. For tours in the wider area Follo, the bus is the best option, both north towards the capital, Oslo and south towards Østfold county. Drøbak has good ports for small boats. The surroundings around Drøbak provide excellent opportunities to use a bicycle or motorcycle. If you drive a car, you should be aware of the many toll booths in the area. Taxi is a rather expensive alternative. Go for a walk in the city centre, with the many art galleries. Take a look at the picturesque buildings everywhere. Go for a sea bath in Badeparken or one of the many beaches in the summer. Note: The local authorities closed all food sale after midnight because they did not want people in the streets at night time. So no burgers, etc., on the streets of Drøbak. Hvitsten (to the south) - an idyllic little port where the famous painter Edvard Munch had his summer residence. Son (a few miles to the south) is a cozy, traditional village and port in Vestby municipality, even smaller than Drøbak that consists of small, picturesque houses and reputable restaurants near the seafront. A popular location for different artists. Tusenfryd Amusementpark is a necessary stop for children, on your way northwards towards Oslo. Kilde: Wikivoyage, Wikipedia + This travel guide page was last edited at 21:33, on 6 August 2018 by Wikivoyage user Wrh2Bot. Based on work by Wikivoyage users Carsten R D, Traveler100bot, Traveler100, AndreeBot, Ground Zero, Simon Peter Hughes, Matroc, CarstenR and Jjtkk and others. Hvitsten is the Norwegian "equivalent" to Positano, Italy, where brick houses are virtually stacked on top of each other on the hillside seemingly diving into the ocean. The difference is that the houses "stacked upon each other" here are white wooden houses. Hvitsen is located midway between Drøbak and Son. The village has two popular beaches, Hvitsten beach located in the Hvitsten's harbor bay, and Emmerstadbukta a couple of kilometers south of the village center. Around the early 1900s Hvitsten and Emmerstad were popular among the Christiania Bohemians in the capital Oslo. Today the village has a mixture of locals and holiday home owners. Moss is a coastal town and a municipality in Østfold county, Norway. The administrative centre of the municipality is the town of Moss. The city of Moss was established as a municipality on 1 January 1838 (see formannskapsdistrikt). The rural municipality of Jeløy was merged with the city on 1 July 1943. Its administrative district covers areas east of the town, such as the island of Dillingøy in the lake Vansjø. Parts of the town are located on the peninsula of Jeløy. Moss city has 30,723 inhabitants (2012). The Old Norse form of the name was Mors. It may be derived from an old root mer- which means to "divide" or "split". Mosse-elva. Mosse -"marsh-river-border"+ Elva -"see Elbe, Elver Old Norse for river" The name is thought to be very old and the meaning of it is not clear. Mosse-sundet. Mosse-"marsh-river-border"+ Sundet (Moss channel). Mosse-herred. Mosse-"marsh-river-border"+ Herred -"Court" akin to hort(us,en), "garden," from PIE *ghr-ti-, from base *gher- "to grasp, enclose" (see yard) Actually "Moss county". Archeological finds suggest that there were settlements in the area more than 7,000 years ago and continuously through the Iron Age, Viking Age, through to modern times. During the Viking era, the place was known as Varna (forne, vorne, front-protection?) and was the site of a cooperative for battleships held by local warlords on behalf of the king. The first literary reference to the name Mo(u)ſs(ß) is from Bishop Eystein Aslaksson's Red book (NRA AM fol. 328) from 1396, and by then the town had become a commercial center with craftsmen and mills. By the 16th century, the town's port was significant enough to warrant its own customs official. Liquor distilleries became one of the dominant industries, and it was not until 1607, after the Reformation, that the town got its own church. By 1700, Moss had become a hub for both ship and land traffic between Copenhagen and Christiania, and in 1704 Moss Jernverk (Moss Ironworks) was established just north of the city center. By 1720 it received its charter as a merchant town, with its own official. This may have had background in an important battle in 1716 that was fought in the town square in Moss in which Norwegian troops commanded by Vincent Budde prevailed over invading Swedish forces, sent by Charles XII to capture Akershus Fortress. In 1767 a local resident built a "pleasure pavilion" near the town, which survives as the Hotel Refsnes Gods. In 1814, Moss became the site for the signing of the Convention of Moss, which effectively put an end to the Dano-Norwegian kingdom. This set the stage for economic development that has persisted to this day. On the morning of 14 July 2006, a bolide exploded above the nearby town of Rygge - moments later, several stony meteorites fell over Moss. A number of meteorites were recovered by local residents and visiting meteorite hunters, which after analysis and classification, were found to be a rare type of carbonaceous chondrite. The coat-of-arms is from modern times. They were granted on 2 April 1954. Moss became a separate city in 1786 and received its first seal in the same year. The seal showed a church under some clouds, the whole thing placed within a circle. Above the circle there were some fasces, the freedom symbol of the late 19th century. A later seal, dating from around 1829, shows the same composition, but now also with six birds flying around the church. When in the 1930s the city wanted to adopt a coat-of-arms and the birds were chosen as a possible symbol. The original birds probably were doves, symbol of peace. In 1934, the idea of the crow was launched, since the nickname of the inhabitants was 'crows'. The arms were finally granted in 1954 and show a yellow crow on a red background. It was designed by Christian Stenersen. There is a tale being told in Moss about the Church fire: The city of Moss always had a lot of crows, most likely because of the corn being harvested in the region. The fire disturbed the crows that started to make a lot of noise and the inhabitants rescued the church from total destruction. After this episode the idea of crow as arms was launched. Moss and Virginia Beach, Virginia in the United States are sister cities. On Good Friday, 27 March 1891, the Norwegian bark Dictator, whose home port was Moss, was lost in the treacherous waters of the Graveyard of the Atlantic. The ship had been en route to England from Pensacola, Florida with a cargo of Georgia Pine lumber. After being caught and disabled in a storm, she was headed for port at Hampton Roads, Virginia to make repairs when she encountered another storm just off Virginia Beach. Working in the high winds and seas, lifesaving crews from shore were able to save some of the 17 persons aboard. However, the pregnant wife of Captain J.M. Jorgensen, Johanne, and their 4-year-old son Carl were among the 7 persons who drowned. The ship's wooden female figurehead had washed ashore. It was placed in a vertical position facing the ocean near the boardwalk as a memorial to those who lost their lives in the shipwreck. It was a landmark there for more than 60 years, but gradually became weathered and eroded. In 1962, Norwegian sculptor Ørnulf Bast was commissioned to create two nine-foot bronze replicas of the original figurehead by the City of Moss. The Norwegian Lady Statues were unveiled on 22 September 1962. One was presented as a gift to Virginia Beach, and an exact duplicate was erected in Moss to unite the two sister cities. Each statue gives the appearance of facing the other across the Atlantic Ocean. On 13 October 1995, Queen Sonja of Norway visited the Norwegian Lady statue in Virginia Beach, and placed memorial flowers. The town is known for paper mills, as well as metalworks and other factories. Dillingøy is known as a place for alternative non-military civil service. Moss is mentioned since the Renaissance and was the site of the signing of the Convention of Moss in 1814, which solidified the union with Sweden. The headquarters of textile producer Helly Hansen were located in Moss until 2009. The maker of international hotel keycards, Trio Ving, also has their headquarters here. Moss FK are the Town's football club. They play in the Second Division, and have played in the Norwegian Premier League as recently as 1990. A traditional expression, [the hay scale at Moss] høyvekta på Moss, means "something that you can not trust". "Navn på steder og personer: Innbyggjarnamn" (in Norwegian). Språkrådet. Retrieved 2015-12-01. Norske Kommunevåpen (1990). "Nye kommunevåbener i Norden". Retrieved 2008-12-16. "Kråke som byvåpen" (in Norwegian). Moss Kommune. Retrieved 2008-12-16. "Immigrants and Norwegian-born to immigrant parents, by immigration category, country background and percentages of the population". ssb.no. Retrieved 24 June 2017. "Vennskapsbyer" (in Norwegian). Moss Kommune. Archived from the original on October 3, 2011. Retrieved 2008-12-16. Sylfest Lomheim (2015-08-05). "Dølar på Dalen". Klassekampen. p. 10. Moss is a typical industrial town, with 250 firms of various sizes within municipal boundaries. TrioVing, Peterson and Helly Hansen are well-known examples of local businesses, Helly Hansen head office moved to Oslo. The ferry connections to Frederikshavn in Denmark and Horten make Moss a communications crossroads, thanks also to European Highway 6 runnlng right outside the town and the railway through it. Moss large and modern port handles over 2.000 calls a year. In 2007 the military airport called Rygge just outside Moss was converted into a civil airport - Moss Airport. A ferry line (the Bastø Ferry) across the Oslofjord runs between Moss and Horten. The county Governor of Østfold works out of the brand-new and dominating Government Offices in Moss. The Moss Crow is a well-known symbol of the town. Its arms used to show a church with birds flying round the tower, standing for the pigeons that once alerted the townsmen to fire in the church. In popular parlance the pigeons became crows, and in 1953 the new town arms adopted the crow as emblem. For a description of sights, bathing beaches etc. Moss and the surrounding district has most of what a summer tourist could wish. A unique location in the most accessible part of Norway - a crossroads by land and sea. The Moss District can offer a variety of experiences and attractions. Bathing beaches, for example - there are more than 40 of them, including the Lido (Sjøbadet) in the very centre of the town. lf you want to stay in a hotel or motel there are many options, either in the centre of the town or in more rural surroundings - or beside trunk routes. Campsites are numerous. Moss has a full and varied commercial centre, with a mixture of specialist sbops and larger shopping malls, and a wide spectrum of restaurants and pubs. If you are interested in art, you have come to the right place. Moss is now known as "Gallery Town" - for the sake of its fleet of art galleries large and small, with Gallery F 15 on Jeløy island as the flagship. The district can offer unique countryside such as Mossemarka, Jeløy and above all Vansjø. Several festivals are organised in the summer months, as well as shows, concerts and other cultural events. Stay with us a few days, therefore, and absorb some of what summer in Moss and District can offer. We will do our best to make you feel at home! The Canal in Moss is an idyllic and lively commercial centre, with a beautiful sheltered guest marina and numerous fine shops close at hand, the Canal is "THE" place to go in Moss. The guest marina is a popular place all summer long, and many visitors even come by car. A growing number of caravans and motorhome tourists are also discovering the area. Lured by the temptations of the nearby beach, many take the opportunity to enjoy an invigorating swim. On the north side of the bridge is the Sjøhuset and Fiskebasaren both offer refreshments and evening entertainment. Jeløya was actually a peninsula in the Oslofjord, but was divided from the mainland in 1855 by the Moss canal (Mossekanalen) a 20 meter broad canal that was built through the low isthmus. The Canal Bridge (Kanalbrua) is the link between Jeløya and the mainland at Moss. This was at first a low, sliding bridge, and since 1957 a simple-leaf Bascule bridge, but dating from the early 1990s has been locked and unable to open. Part of the city of Moss lies on the south-eastern part of Jeløya. Twenty-five years ago Gallery F15 took form in the venerable main building of Alby Manor, South Jeløy Conservation Area. Thanks to a large number of important exhibitions the gallery's fame has reached far beyond the borders of Norway. In time other galleries have grown up beside it, and all together they make up what has been called "the Moss Gallery District". Moss is a town and a district with a multicoloured gallery flora and a rich artistic community, especially in Son. Moss itself has more than 70 sculptures within the municipal boundaries, and this also serves to emphasize the position culture enjoys in Moss and District. Refsnes Gods is a hotel on the island of Jeløy, clopse to the Oslofjord just outside the mansion. The building was originally constructed in 1767 as a pleasure pavilion. It contains a notable art collection. "Gods" means mansion in Norwegian. Since the new owners took over, a large number of unique pieces of art have found a new home at Refsnes Gods. Every guest room and all the common areas have works of a dedicated artist displayed. More than 400 pieces from 90 well-known artists are represented. The list of the artists include names like Andy Warhol, Edvard Munch, and Jacob Weidemann. Three works by Munch were stolen from the hotel in March 2005; they were shortly recovered, although one of the works was damaged during the robbery. The resort is also known for its wine cellar. Moss is one of Norway´s oldest and most versatile industrial centers. Mill city (Møllebyen), which is located by Mossefossen waterfalls was the central point for the city´s first industrial epoch and held this status until approximately 1970. Møllebyen now prevails as a unique historical city environment, where new ventures are established in the old houses and new buildings. Today you find serveral restaurants and cafeés, a large moderc cinema and Moss City and Industry Museum in this area. Møllebyen is the former city center in Moss. Among other things, the historical King´s Road to Copenhagen passed through the area. Most of the buildings in Møllebyen which have been used for milling are known as Lerke Mølle, Kloster and Galle Møller (named after the owners), Central Warehouse (Central Pakkhus), Kvernhuset (The Mill) and so on. However other activities were also carried out. Among other things, we find the cities first waterworks, which were established in 1876. The assembly of buildings in Møllebyen are of great historical value. They represent an entire building environment with high architectural quality. The buildings were basically built with a solid foundation and the construction between floors is of wood. The outer walls are of brick. Typical of the architectural features are large roof areas, clearly defined cornices, pillars of brick, cast iron windows, eloquent gables and richly detailed masonry. The Torderød estate was cleared alredy during the Viking era, while the current estate, the Torderød mansion was built as a summer residence by David Chrystie d.e. in 1758-60. The building is listed, and the Torderød park is the district´s only purely baroque garden. The beautiful premises are hired out to parties. Torderød Gårds Venner (Friends of Torderød Gård) conduct an interesting tour of the main building and the park. Ekeby Farm is a farm with many goats. The farm is situated by the two natural reserves, Telemarkslunden and Gunnarsbybekken. At Ekeby, taking care of our boer goats is our main priority. Goats are not made to be indoors. They need to have lots of space to move around in all year round. That is why we at Ekeby feed the goats outside. The boer goats don´t like rain and wind, that´s why they have small isolated cabins. Here they can seek shelter when the weather is not good. When it´s cold, the goats keep warm in the cabins by their own body heat. Lake Vansjø unites the municipalities of Moss, Rygge, Råde, Våler and Vestby. With its countless coves, sounds, bends and islands, Lake Vansjø is a rare gem. The lake´s close proximity to urban areas makes it perfect for recreational activities like swimming, fishing, walking, paddling or camping out. Enjoy a day on the fjord with the gentle wash of the waves, the insistent cry of a seagull and the leisurely pace of a boat. Treat your family to an outing with activities like fishing, playing, cycling and a picnic under the open sky. Moss & Rygge Golfclub is a golf course with 18 holes and a variation of difficulties. The course lies at Larkollen, approximately 8 km from Moss Center. Son is called Norway's "northernmost southern town". It is easy to understand. Small white wooden houses along twisting streets is a characteristic feature of this coastal gem located along the sunny side of the Oslo fjord. In addition to its idyll, Son is also offering much history and exciting coastal culture. Did you know that the entire Oslo fjord was once named after little Son? Son is a densely populated place (6,000 inhabitants) by the Oslo fjord in the southern part of Vestby municipality in Akershus county. It is especially known for its old buildings from the Dutch period, with wooden houses and narrow alleys that give a distinctive look that one might associate with towns along the coast of southern Norway. It is therefore only natural that holiday makers multiplies the population in the summertime. And the numbers of visitors will probably not be any less in the years to come. The hotel Son Spa, which last winter was named 'Best Quality Resort 2010 in Scandinavia', has atrracted lots of tourists and other visitors to Son since its opening in 2008. The new spa facility is situated where Jack M. Iversen built his famous sailboats in the period between the two world wars. Paradoxically bad economy was the reason why Son is one of the Oslo fjord's best preserved towns. Earlier they simply could not afford to demolish the old wooden houses. Today 200 houses are registered as preservable. Three old trading houses are situated along the harbor. One of them is Thornegården from 1640. It is the second oldest building in the Oslo fjord and has an architecture characterized by both Renaissance and Barocque. If you go into the backyard you can see that it is a half-timbered house, clearly influenced by the Dutch style. Strolling along the Strandgaten you will find eccentric artists' houses and Little Skaugum. The latter house is rumoured to be a miniature copy of Skaugum before the fire. Spinnerigården, Stoltenberggården and Wollegården, all from the 1700s, are other listed buildings bearing witness of prosperity in Son's heyday. You can also admire imaginative reconstruction of old outhouses and barns. Down by the harbor is Son Coastal Culture Center scattered in several buildings. Here you can visit an old fisherman's house and learn about faith and superstition among fishermen. The Center also has a forge house, seaside cottage, a museum pier for old wooden boats and a boat yard. The Coastal Culture Center also owns a fishing net dryer, one of the very few remaning ones in the fjord. Son is a favored port and natural stopover for boaters. There are almost half a million recreational boats in Norway, and no country in the world has more boats per capita. In Son's harbor are more than 1,000 boats of different types and sizes, and there are also particularly many guest spots here. In other words, the port represents a large part of Son. Son Seilforening (Son Sailing Association) has asserted itself for a long time as one of the Oslo fjord's most active sailing associations. It became famous after one of its members, Siren Sundby, won the gold medal in the Summer Olympics in 2004. Son Marina was also used as location for the TV series “Båtliv (Boat Life), which aired on NRK (Norwegian Broadcasting Corp.) in 2003. An important feature of the port in Son being one of the most attractive harbors in the Oslo fjord, is that it is relatively deep. This makes it easy to dock large sailboats at the pier in Son center. If you're going out to eat, Son is definitely the place. Son has several restaurants and eateries, art galleries and shops. From my stay in Son last summer in connection with collecting background material for this article, I still remember, 10 months later, that I should remind myself to recommend Son Kro in this article. When a restaurant offers the very best of service and food experiences, it is only proper to salute Son Kro. It is especially nice when food and service are top-notch, which is exactly what it was on this warm summer evening at Son Kro's terrace. In Gallery Son's magnificent garden you can enjoy good drinks with a view to the throng of people on the beach promenade below. In the evenings a DJ often ensures a relaxed atmosphere by playing songs in the "chill out" category. Early in the 20th century Son became an artists' town. Celebrities like Nils Kjær, Ludvig Karsten, Herman Wildenwey, Ronald Fangen and the eccentric painter Karl Dørnberger were among those who settled here. Even today a number of famous artists live in Son, and there are several galleries here. Son is a paradise for those who love the beach life. Son Beach is 200 meters from the town square and has rocks, a diving board, swimming ladders and a kiosk. The Brevik bay is located in a particularly wonderful recreational area south of the spa hotel. Here are polished rocks facing south and west, excellent for sunbathing, a beach volleyall court, parking and toilets. Nordre Sauholmen is an excursion islet (located in the sound outside the spa hotel) with child-friendly sandy beaches. Nordre Sauholmen has many fine rocks with great fishing opportunities. If you throw out the line here, you run the "risk" of catching a fjord mackerel or a whiting. On the islet are several well-preserved sea sheds and old tan equipment for the preparation of fish nets. Here are good anchoring opportunities (no public pier) with mooring possibilities on the west and east sides of the islet. Large area around Son is open for public recreation. With a rented horse and carriage, or a with a rowing boat, you can take a trip to the old lading site at Hølen. This trip is called a truly exotic experience. Or you could try the coastal culture trail to Hølen and Vardeåsen with a view of the fjord from Oscarsborg fortress to Færder lighthouse and four counties. The hike to Kjøvangen is alone worth the experience of this vigorous avenue. Come visit when it is at its most beautiful in late May or early June. North of Son is the public area Kjøvangen with a small pebble beach, rocks, grass areas and a pier with fishing opportunities. Widely used by locals. A Bronze Age burial mound is also in the area. Kjøvangen is a great hiking area; go past the ice dam Stamnestjernet and all the way to the top of Vardeåsen. From here you can see everything from Drøbak in the north to Bolærne (Sweden) in the south. After you have passed the golf course on your way to Kjøvangen, you'll be walking along one of the most beautiful avenues in the region. The hike to Kjøvangen is alone worth the experience of this vigorous avenue. Come visit when it is at its most beautiful in late May or early June. Drøbak has Santa Claus, Son has the angels. Its not just in the summer that Son buzzes with people and activity. The Lucia procession on December 13 is one of the biggest events in Son during the exciting Advent packed with activities. The summer town of Son offers lots of enjoyment for the whole family around the harbor area - even in winter: Cafes and restaurants have Christmas and angel menus. How about doing your Christmas shopping in Son? Angels in all shapes and sizes adorn the streets, square, shops, and restaurants. The name Angel Town has its basis in Gallery Son's annual angel exhibition, which the gallery's owner, Marianne Helle, started 12 years ago. It is an exhibition with angels in all varieties; sweet, small, large, and angels full of character. When you arrive at Son in the winter you will now be greeted by angels with candles and with live lanterns outside shops and cafes. Amazingly evocative! Zoon, Zoen, Soon or Son? Did you know that the entire Oslo fjord was once named after little Son? The first maps of Norwegian coastal waters are of Dutch origin. There were several reasons for it. Firstly, the Dutch were skilled cartographers. Moreover, they imported large quantities of timber from Norway with their own ships. One of the maps that has been preserved from this time is drawn by Lucas Janszon Waghenaer from Enkhuizen. It is reproduced in "Spiegel der Zeevaerdt", a sea atlas published in 1583. The map is small scale and covers the coast from Merdø via "Zoen Water" to Uddevalla (Sweden). Zoen Water was the Dutch name for the Oslo fjord. It was probably named after Son, which was an important lumber port. Lucas Janszon's map provides a rough simplified picture of the waters and only includes the largest islands and fjords. The name Son is not verifiably explained by official place name research. A prevailing view is that it has a river affiliation. The name is assumed to come from the river Saanen which runs through the neighboring parish Saaner, then to Hølen, further on to Son before it empties into Sonskilen with the name Hølenselva. The name has also been linked to the verb (to) sow, used for fish spawning and in this case meaning "spawning river". It has also been attached to the verb svona - svinne inn, minke (shrink, dwindle), so that the meaning becomes "the river that dwindles greatly when drought". In earlier times Son was also written Soon, Zoen, Zoon and Sogn. The latter spelling is considered to be based on a misunderstanding that the name stemmed from the word "sogn" (parish); it doesn't seem to have been used locally. "Son" became official spelling in 1891. Earlier "Soon" seems to have been used most often. Several businesses in Son use the spelling Soon if it is part of their company name. Son is an ancient seaport by the Oslo fjord, between Hvitsten and Moss. The town had 586 inhabitants in 1920. Son was used as a harbor for Christiania (today Oslo) when the inner parts of the fjord was covered by ice. Son's heyday as a commerce center and shipping harbor started around 1550. First through the export of lumber, and until 1900 large quantities of wood materials were exported from Son, especially to England, the Netherlands and Denmark. Zoon Water is used as the name of the Oslo fjord on old Dutch maps. Shipowners opened business in Son. Many other businesses were established at the same time; lumber trading, tobacco spinnery, and licquor distillery. They all contributed to Son's prosperity in the late 1700s. The town was an important lumber harbor already during the Dutch period from the end of the 1500s until well into the 1700s. The town received its customs rights in 1604. Customs revenues were large, and Tønsberg, Fredrikstad and later Moss tried to incorporate Son. In the 1670s Son had twice as much customs revenues as Moss. The population naturally grew in line with the prosperity growth. Several of the buildings in the city are from the glory days that followed, including the brick building Thornegården from 1641 and the timber buildings Stoltenberggården and Spinnerigården. The latter was named after Ove Meyer's Tobaksspinderi. Ove Meyer lived here from 1750. Son's growth stagnated after 1720, when Moss became a town. One could float timber to Moss from a far wider area around Vannsjø and Moss were thus able to offer somewhat better conditions. During the last half of the 1800s the export of ice was also an important commodity for Son. Son got its own fleet of schooners in the 1800s, and 23 ships were domiciled there in the 1890s. However, by 1905 Son was no longer home for proud sailing ships. The fact that Son Sailing Association is one of the most active in the Oslo fjord today, is kind of a maritime continuation of history. Early in the morning of April 9, 1940, after the German fleet heading for Oslo had been forced by Oscarsborg fortress to turn back, the ferry "Oscarsborg", also known as "Borgen", which shuttled between Son and Oslo, was hijacked by the cruiser "Lützow". Around 300 soldiers and officers boarded the ferry which docked at Son. Thus, the town square in Son was the first place where German soldiers set foot on Norwegian soil during the invasion, with the exception of those who had swum ashore from "Blücher". A total of about one thousand German troops were put ashore in Son during the day. On April 28, 1940 the Royal Air Force tried to bomb the fuel stockpiles at Laksa with phosporus bombs. They missed their target and no buildings were damaged, either. The town center was evacuated during the attack. 45 minutes from downtown Oslo you’ll Larkollen in Rygge municipality. Larkollen, with its grand wooden villas and tightly packed beaches, is a favorite destination not only for tourists, but also for those who come here just for the day. With is combination of rocks, several recreational areas and shallow beaches, is this a typical summer resort. Just a few years ago, Larkollen was a village where not a lot happened. The “Losen” very quickly became a meeting place where both locals and vacationers thrived. Støtvig Hotel opened in November 2013 with much to offer for both overnight guests and those who make use of the offerings on a day's visit. Larkollen is a small village with about 1,500 residents, but during a few hectic summer months this number doubles. Larkollen is a nice and popular place to live, but perhaps even better to spend the vacation, whether it is in a caravan, tent or own cabin. The name Larkollen does not appear until around 1650. The port of Larkollen is well suited for sailing ships, and was at that time the most popular port on the eastern side of the Oslo fjord. It was safe for large ships to anchor here, sheltered by the Kollen and Eløya islands. Larkollen was an important harbor for sailing ships in the 1700s, and pilots, captains, innkeepers and craftsmen happily settled here. Images in the slideshow: Boydell's picturesque scenery of Larkollen - John William Edy. John William Edy (1760 – 1820) was an English painter. He worked for the publisher John Boydell in London, often anonymously. In the summer of 1800 Edy visited Norway on an assignment for Boydell together with the landscape painter William Fearnside. They were in Norway from July 31 and until the end of September the same year. Edy made numerous drawings from the trip, among them drawings of Ny-Hellesund which was the place the two artists arrived at in Norway. In Norway he is also known for his drawings of Christiania (Oslo), Larkollen and Moss. Boydells Picturesque Scenerey of Norway was published in London in 1820. It is easy to understand why this wonderful place began to attract vacationers in the late 1800s. In 1879, the railway between Christiania (Oslo) and Halden opened, with a stopover at Dilling, located 7 kilometers from Larkollen. Larkollen thus became an attractive and available area for bathers in the summertime. In the 1900s, holiday makers continued to visit the place in large numbers, and many rented rooms with permanent residents. Eventually cabins were built, too. Additionally, Larkollen got a steamship wharf, where fjord boats called en route from the capital and made it easy for even more people to spend their vacation here. In the summertime the Larkoll sound is heavily trafficked by boats, even today. There are many places to visit around Larkollen, and the town itself is also nice for families on day trips. Here you can walk dryshod to Danmark! By this we don't mean the country Denmark, but the small peninsula located south of Larkollen. Via a several hundred meters long naturally built stone dam you can walk on dry land to the peninsula at low tide. Here you can relax, fish sea trout, enjoy the view and swim. There is a pine forest with red and white wild roses on the peninsula. An ideal place for a picnic. If you get surprised by the high hide while you are here, we are happy to inform you that the water is only knee-deep. Via a several hundred meters long naturally built stone dam you can walk on dry land to the "Denmark" peninsula at low tide. Blomsterveien runs between Halmstad, Larkollen and Ekholt/Øreåsen. Blomsterveien is the name of a number of trails criss-crossing throughout the region. This system of various paths is aiming to pave the way for biking and hiking in Rygge municipality. There are several types of landscapes, sights and monuments around Blomsterveien. The route is marked with signs and markers decorated with a flower. The Kollen and Eldøya islands are located on the other side of the narrow strait across from Larkollen. The islands are situated within the Eldøya-Sletter conservation area. The most of this area consists of sea. On Kollen you'll find woods and thickets, while Eldøya offers a varied landscape with meadows, woods, thickets and a pond. Eldøya is no lonher inhabited. It is nice to go here for a day's visit, and there are several good tenting spots for those who wish to stay here overnight. It is easy to dock a boat on the beach, which is located on the northeast side of the island. As many as 380 plant species are registered on Eldøya. The vegetation is protected, but it is allowed to pick berries and collect mushrooms. Nice trails run to Eldøytjernet (pond) and Vardeberget in the southwest, where you can see burial mounds from the Bronze Age. Visit Balke gård this summer. The farm is located a few hundred meters after the exit from Larkollveien road against Rygge church. The farm has horses, ponies, rabbits, pigs, goats and birds. Balke gård also has a café, and local artists often have art exhibitions here. You can discover Larkollens´s world just a short drive (45 min) from Oslo. Botnerbaugen is located northernmost in Larkollen near the Evjesund area. The popular beach area consists of both two sandy beaches and rocks. There is a lot of seaweeds and rocks in the water. The beach is therefore best suited for small children who don't go far out. A large bench is placed on the beach. A little further south are great rocks with diving board and swim ladder. The area has a good supply of water from the bay. An outdoor latrine is placed at the large car park, which is 400 meters from the beach. Driving onto Tollbuveien road you'll arrive at Tollerstranda beach, a little south of Botnerbaugen. Tollerstranda is a small recreational area, secured by Oslofjordens Friluftsråd as early as 1935. Today Tollerhuset is a resort for employees of the Customs Service. Customs officers were stationed in Larkollen until 1960. The beach consists of a west-facing slope with rocks in the water and lots of seaweed, but a swim ladder provides easy access to the water. But be careful, the water is very deep. Best access to the water is from a small pier. There are toilets and a few benches at the site, as well as a large car park. The site is not very child friendly and therefore best suited for sunbathing. Billmannsbakken beach is perhaps the finest and most child friendly beach at Larkollen. A lovely curved sandy beach and a long pier, which is nice to dive from. You can find the beach south of Tollerstranda. Drive onto Billmannsbakken and you'll see the beach, eventually. Støtvig is a south-facing flat bay with a nice sandy beach suorrounded by jetties and breakwaters. Here is a floating dock and diving opportunities from a height of 1.5-2 meters from the pier. Here is a lot of traffic both at sea and on land. New Støtvig Hotel is next door to the beach. Støtvig is a south-facing flat bay with a nice sandy beach suorrounded by jetties and breakwaters. Here is a floating dock and diving opportunities from a height of 1.5-2 meters from the pier. Here is a lot of traffic both at sea and on land. Støtvig Hotel is next door to the beach. Engholmstranda and Langstranda are two beaches to the west in the innermost part of Larkollneset in the area locally called "Paradise Bay". You’ll get here by turning off the road at the sign at Larkollveien, then drive approx. 1 km south through the forest. The parking is located on the right hand side inside an old gravel pit. The northern beach is named Engholmstranda and is a nice sandy beach of nearly 200 meters with a flat spacious level behind it. There are toilets on the west side of the level. Lanstranda is located south of Engholmstranda, and is separated from it by 4-5 cabins. The sandy beachis facing northeast, wide and nice with some pebbles and not very child friendly.There is a floating swim platform and kiosk at Larkollen Camping. Two car parks, a small one near the water and a large one approx. 500 meters from the beach. The southwest facing Danmarksstranda at Larkollen Camping is considered by many to be the area’s finest sandy beach. There are also some rocks here, and a beach volleyball court. A large car park approx. 200 meters from the beach. The three Sletter islands (Store Sletter, Midtre Sletter and Søndre Sletter) located southwest of Larkollneset, confirm their kinship with the other islands along the Østfold coast. A reddish, sharp and gnarled conglomerate of rhomb porphyry is sticking up in the day. The islands are a collection of flat, grassy islands off Larkollen. They can only be reached by boat, but docking is easy on all islands. Store Sletter has an especially nice sandy beach. The islands got their names because of their appearance. There are not many traces of people on the islands, apart from tourists during the summer season. Store Sletter was inhabitated in the late 1800s. They grew potatoes and minded the livestock, own by the Tomb manor and placed here for grazing in the summer. On top of Store Sletter are three major Bronze Age cairns, bearing witness of ancient habitation. If you decide to visit here, your main purpose should be the experience. To perceive the special un-Norwegian landscape - in a positive sense. The three Sletter islands (Store Sletter, Midtre Sletter and Søndre Sletter) located southwest of Larkollneset, confirm their kinship with the other islands along the Østfold coast. A reddish, sharp and gnarled conglomerate of rhomb porphyry is sticking up in the day. The islands are a collection of flat, grassy islands off Larkollen. They can only be reached by boat, but docking is easy on all islands. Store Sletter has an especially nice sandy beach. Norway's biggest instance of the beautiful spring flowering Pasqueflower, Pulsatilla pratensis, can be seen on Store Sletter and Midtre Sletter. We must otherwise go to Eastern Europe's steppes to find a similar terrain with much Pasqueflower. May is the best month to observe these flowers. The flower is bell shaped and nodding with a brown-violet exterior and a dark blue violet inside. The northernmost growing place in the world for this plant is Hovedøya near Oslo. The Swedish frigate "Venus" with a crew of 300 was borded outside Søndre Sletter by five ships from the Russian Baltic fleet after a short battle. "Venus" was taken as war booty and sailed in the tsar's service for many years after the crew were taken prisoners of war. Several shipwrecks have happened near the Sletter islands. The schooner "Waldemar" of 200 gross tons went down in 1880. Another schooner, "Vigil" of 120 gross tons and loaded with coke, decreased at Sletter in 1990 and the brig "Lina" was loaded with ice when she sank in 1906. The islands have a total area of approx. 16 acres. There is a sea bird sanctuary on Store Sletter and Søndre Sletter, and both islands with adjoining sea areas are included in the Eldøya-Sletter conservation area. Store Sletter has a gangway pier, information board and toilet on the eastern side. The island is well suited for camping. Cycling the Coastal Trail. Early autumn is a perfect time for cycling. Slanting sunlight and warm wind make the experience pleasant and rewarding. The Larkollen Week takes place in Mid-July each year, with activities for the whole family. This is a popular event among both residents and holiday makers. Over the years the week has included activities like Olakjerre (homemade "cars" by kids) races, sandcastle building competitions, concerts and local theatrical performances. After only a 10 minutes’ walk from the street in Moss city, you’ll find yourself on Jeløy Island, which many call "Oslofjorden’s pearl." The island is known for its rich cultural and farm landscapes, but the island should really just as known for its geologic wonders. Did you know that there is a time gap of more than 500 million years between the ancient bedrock on Jeløy and the younger on mainland Moss? Jeløy brings out all of the best emotions in you. The beautiful scenery of lush farmland and the blissful views of the Oslofjord are breathtaking. The vibrant culture history takes you back to yesteryear with stately homes and landscape which are characterized by alleys, stone walls and gardens. There are large green spaces in the form of forests, as well as countless excursions to choose from. There are a number of really great beaches on the island, both child-friendly sandy as well as pebble beaches. Some of the beaches are very crowded, while others are great beaches you can have all to yourself, even on sunny days. AUTUMN SUN OVER JELØY IN MOSS. CHECK OUT THE LONG AVENUE LEADING TO ALBY FARM AND GALLERY F15. When you arrive in Jeløya, it’s not difficult to understand why this is the artists' island. The lighthouse and its views of the scenic cultural landscape and the sea are unique and inspirational. The island's cozy art galleries and studios are well worth a visit. Here you’ll find, among other things, a glass house that specializes in handmade glass art, crafts, interior and design shops, pottery, photo artists, a silversmith, florists, photographers, shoemakers, a guitar maker, a wallpaper shop, and clothing designers. Cycling is definitely the ideal way to travel when on Jeløya. There are many narrow roads and paths that crisscross the whole island. On the way out to Jeløya, you’ll easily be able to take the coastal path that starts at the canal bridge in the center of Moss. Jeløya offers such diverse experiences and has one of the country's finest stretches of coastal path. We recommend that you take your bike to Jeløya, simply to reach several of the attractions of one of Oslofjord’s largest and most intriguing islands. JELØYA HAS ONE OF THE COUNTRY’S RICHEST FLORAS, INCLUDING HEPATICA AND MISTLETOE. ON THE ISLAND, THERE ARE MORE LANDSCAPE AND NATURE RESERVES AS A RESULT OF THE UNIQUE NATURE. THE ISLAND HAS GREAT HIKING WITHIN ITS ALLEYS AND BUILD STI-SYSTEMS, INCLUDING THE COASTAL PATH. The first part of the path on Jeløya is Southern Jeløy, an outstanding natural landscape. The path to the Southern Jeløy goes over the channel bridge - through Channel Park, past Sjøbadet, the town’s swimming beach in the heart of Moss. The trail goes along the roads and walkways. By Fiske Beach, we follow the trail along the streets to Vårli, while those who wish can walk along Fiske Beach and to the forest trail over the hill to Vårli. The coastal trail continues to Framnes where it runs into Southern Jeløy landscape, with meadows and mixed forests at Reiertangen. A beautiful alley with stone walls leads up to Jeløy Radio. The coastal path continues through a varied landscape between the manors with fields, stone walls, and a stunning archipelago nature and, at times, the path winds its way down to the water's edge. This lush and open landscape, the moraine that formed in Østfold for 10,000 years ago, created a completely different exuberance than in the rest of the country. The good earth is easily accessible and central location of the Oslo fjord trading route was probably the main reason why so many mansions were built in the region. The area of Jeløy and south was once a Manor County more than anything else. 25 percent of all the mansions in the country lay in this county, which at that time included Båhuslen. Beyond here the road went to the rest of continent. People spoke French and had great cultural exchange with foreign countries. Manors were great gathering places for political meetings and when Christiania Bohemians would have a festive party with the "beautiful people" and the high society. When you see the great manor houses today with the lush gardens, you’ll see how lively they were and how people danced and conversed. Gallery F 15 is one of the oldest and most traditional institutions for contemporary art in Norway. A long and wonderful impressive alley with stone walls on both sides leads up to Alby Gård (Alby farm) that also houses the Gallery F 15. Gallery F 15 is one of the oldest and most traditional institutions for contemporary art in Norway. The institution was established in 1966 as the first gallery of its kind, and the name comes from the address Fossen 15 in Moss, the gallery's first location. There is also a cafe attached to the gallery. There you can buy the famous Alby cringle. Outside Gallery F 15 is a large garden / park where you can enjoy the amazing view over the fjord. The park is actually nice and cool on hot summer days. The gardens in front of the main building at Alby are quite unique among the traditional gardens. The conscious shaping of the terrain and the retaining wall in the south of the garden makes it so that the ground beneath becomes erased from view. At first glance, you might think the fjord reaches all the way up to the farm. This intentional illusion is a well-known tool in the traditional English garden art and of French baroque gardens. In the same retaining wall, a cave was used as a gazebo. In the old storehouse at Alby Gård is also the Nature House, the country's first nature center. The center was founded in 1985 and tells of Jeløy’s natural conditions. A long and wonderful impressive alley with stone walls on both sides leads up to Alby farm that also houses the Gallery F 15. Next door to Alby Gård, Røed Gård (Røed Farm) is not only of great interest in terms of architecture and styles. The couple Ruth and Knut Mamen has painstakingly restored the nearly 300 year old main building and developed the property into a diverse cultural workshop for various artisans and visual artists. Behind the main house is a landscaped park with a trout pond. It has both a bridge and a romantic gazebo. In the spring, the park is a beautiful sight with cherry blossoms and sheep grazing. Around the estate, you’ll find activities like a gallery, farm shop and a courtyard café. The farm is a major cultural center with art exhibitions, concerts and lectures. Summer concerts in the lush garden are described as magical. Many famous artists perform here every summer. From Alby, the coastal path to Albybukt Bay is in close contact with the sea until it reaches Bredebukt Bay. All of the latter stretch is surrounded by forest, and this stretch includes three good beaches along the trail. From Bredebukt, the path changes character to a more challenging and rugged, twisting, narrow path. At the same time, the scenery around you changes dramatically to more rugged terrain with rough and rugged rocks and mountains. In addition, there are a lot of mixed forests interspersed with some spooky thickets. The nature just becomes wilder and it's wonderful to find such a change from the more romantic start of the coastal path on Jeløy. This more challenging route runs from Bredebukt via Stalsberget on the footpath on exciting rugged terrain. After you have hiked down the path to Stalsberget, it opens up a great pebble beach for you. The entire pebble beach is surrounded by steep landscape. Especially in this area at and around Stalsberget, you can find traces of the half billion year old bedrock. The bedrock on Jeloy is of volcanic origin. Jeløya, which is part of Moss Municipality, is approximately 20 square kilometers. 10 kilometers long and 4 kilometers at its widest. Geologically, the island is a sunken area in relation to the mountain on the mainland to the east. The bedrock on Jeloy is of volcanic origin. Jeløy bedrock is from the Permian Period. There is a time gap of more than 500 million years between the ancient bedrock on Jeløya and the younger on the mainland in Moss. The large moraine covers the southern part of Jeløya and the isthmus canal. Forests dominated by herbaceous, coniferous forest, but there are also several stands of deciduous forest. Albyskog (the Alby forest) is behind many of the old beach fortifications damp depressions with alder woods. Otherwise, the area has buffer zones and sandy, pebble, and rocky beaches; each with its own distinctive vegetation communities. The great diversity of habitats and vegetation provide the corresponding variation in wildlife. In particular, insect fauna and many rare species are found here. Among butterfly enthusiasts, Jeløya is well known. Mammal species in this area are mostly come from other places: hedgehogs, foxes, badgers and deer. Bird life is prolific with a total of 185 identified species. Jeløya is conveniently located for bird migration in Outer Oslofjord. A long and continuous shoreline is an attractive feeding ground for migratory birds. The island is known for its rich cultural and farm landscapes, but the island should really just as known for its geologic wonders. A short distance north of Stalsberget, the coastal trail follows along the lake until Tronvik. This distance is no longer challenging after you’ve gone on a wide dirt road. At the water's edge on Tronvik stands the lofty and special building, The Tronvik Torpedo Station. Tronvik Torpedo Station was established in 1916 and closed in 1980. The defense used the torpedo station for testing torpedoes. From Tronvik, there is a route to Lonin along the waterfront until Svaleveien where Hotel Refsnes Gods is. Refsnes Gods is known for its excellent cuisine and a well-stocked wine cellar - not to mention the unique art collection. By Tronvik, the path ends, but that does not mean the fantastic hiking ends with the coastal path, quite on the contrary. Until now, the article has been describing just the southern part of Jeløya. Most of Jeløy landscape remains to be explored. Indeed, when the southern part of Jeloy is out of the way, there is still two-thirds of this beautiful and fertile island. Most of Jeløy northern areas consisting of more rugged terrain than in the south, and there is little settlement, but an incredibly great landscape. Lots of forest, but also open lots of meadows and fields. The shore is undeveloped around most of the island, making it possible to freely walk around much of the island, where there are not too many hills. There are a number of easily accessible beaches all over the island, so there is almost always a beach that is sheltered from today's weather. Jeløya has one of the richest floras, including black eyes and mistletoe. On the island are several conservation areas and nature reserves as a result of the unprecedented nature. Vestre Nes is a popular recreational area located northwest of the island. Vestre Nes Recreation Area is approximately 300 acres and was acquired for recreation area in 1974. The area is forested and has cliff, pebble, and sandy beaches. You’ll notice it by open the pine forest on shallow and dry ground. A very popular campground is located at the bathing bay Nesbukta, north of Nes. From the top of Bjørnåsen, there are fantastic views of Oslofjord and the middle parts of Jeløy. North of Nes, the landscape becomes quite powerful, and from Nes, you can see up to Jeløy’s highest peak, Bjørnåsen. The walk up to Bjørnåsen is highly recommended. You can get up to Bjørnåsen by following the road along the campground to Nesveien and follow this a little further north to a turn. Here you’ll find an excellent path into the woods, which comes with steep terrain through the forest including spruce, pine, linden, hazel and birch. From the top, there are fantastic views of Oslofjord and the northern and middle parts of Jeløy. Have a good trip! The archipelago of Fredrikstad stretches along the coast like a string of pearls. You don't have to travel far from the city to find charming fishing villages, Engelsviken is one of them. 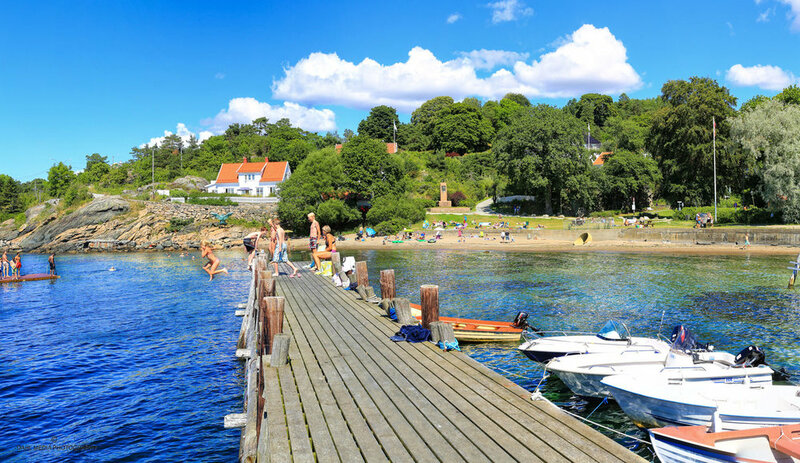 Engelsviken is famous for its fish soup, Summer Show, and with good places for swimming. This page is under construction. We are working hard to launch a new page about Engelsviken with new features. Stay tuned!